the following is a murder mystery based upon true events on sawyer farm. it was originally written in french but was translated by k.m.maclean this past fall and given to Mother as a birthday Handmade gift --the only kind a farmer can afford. it is today submitted to the To Know a Chicken series that i have decided to bore you all with this snow-less january. the contents are gruesome. the story remains unsolved. the day began like any other on sawyer farm. the pigs were thrown their slop. the cows brought down for a morning’s milking. the kittens were harassed by cuddling humans. the dogs were neglected. and like any other blasted morning the chickens were let, out of their coop, and into the great wild world of the Barnyard. the usual feather gossiping ensued. eggs were laid. a great deal of pelletized feed was consumed. it would be just another partly cloudy, low humidity, high of 67 degree day. for all. save one. mr. bardrock no. 001 was extraordinary in life only for his twin-hood --brother and doppelganger to mr. bardrock no. 002-- and for his inadvertent life membership to a tiny and decidedly un-fraternal club of roosters of sawyer farm. it is not my pleasure to speak ill of the deceased but he was, for all immediate rooster purposes, an unremarkable one. bringing little to his assigned post but the minimum. to be just, as i fear i am being uncommonly cruel --he was a young lad of but a year. with the exception of his equally unexceptional but slightly more capable (or perhaps just more fortunate) brother no. 002, no. 001 had little mentor-ship in his quick life. his life, one might say, was utterly void of a developed and healthy protegé/proteger relationship. so it is unfair to judge so harshly a rooster who merely worked with what he was given. 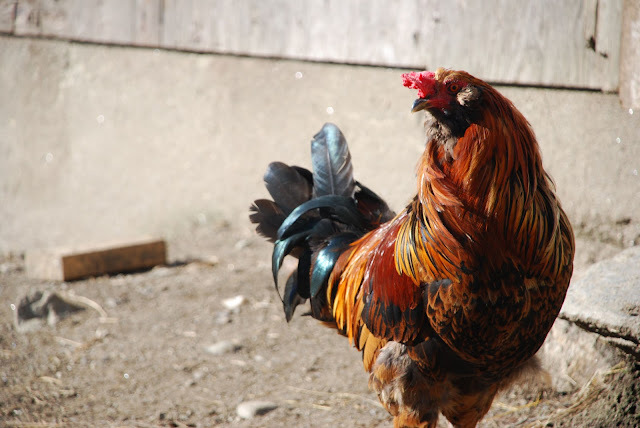 with this void of rooster leadership it came to be that the older, more devilishly handsome veteran rooster, smuggled North across many state lines from the carolinas found an opening for Top Rooster at sawyer farm. petit monsieur. little mister. you must forgive such a misleading prefix as 'little'. for he was only petit in relation to his predecessor. monsieur original who was of french descent and a formidable creature in girth, height, and charisma. because i don't wish to persuade the jury. because there is a piggy in this sordid affair too. a little one named rose. and its unclear if roosters and pigs work best alone or together. rose had a tough run with the transition from South to North. she had been the round pink squealing apple of her mama's eye in carolina. spending the better part of each sun filled day with her tummy rubbed. freshly bathed. fretted upon. newly rotten watermelons in her trough. carolina and mama were good to her. she and life were good. something changed with the move. her dotting mama went on holiday. she was thrust into a farm life to which she had never been accustomed. general slop in lieu of hand foraged garden goods. four poorly mannered goats now shared her quarters. the chicken population had increased tenfold. every single tenant of the sawyer barnyard was her direct competition for food and compassion. growing up and being fed with the ever elusive silver spoon this change of scenery took rose by an unpleasant surprise. the surprise grew to discontent. which swelled to anger. which boiled up to revenge. which was constantly coupled by a gnawing hunger...which....is it possible?... culminated in murder? let us return to mr. no. 001. the protagonist fop of our short tale. expected duties of a rooster at sawyer farm follow standard expectations nation wide. morning wake up. hawk patrol. meal calls. egg fertilizing. a monkey could do a rooster's job if these standards were all that made a rooster a Rooster. but a good rooster...one that removes himself from the monkeys of the world...he rises before the sun. hours before. to ensure everyone gets an earliest start possible to the day. he seeks out perches in the barnyard from where he surveys the sky with one eye. 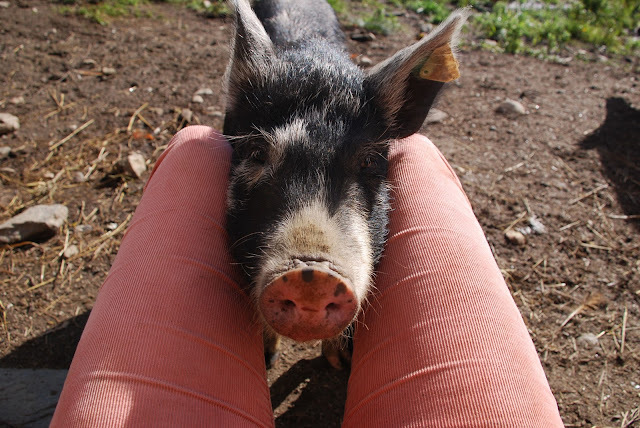 he follows human and pig patterns throughout their day waiting for the drop of a half chewed apple or a splash of fresh cream on its way to becoming butter. he calls a subtle mumble known only to his harem, and they come running. mr. no. 001's heart mustn’t have been in this gig. maybe he imagined himself more as a bigfishsmallpond backyard operator. one who had a more manageable gaggle of hens. one who wasn't expected to arise at a certain hour, or at all. but the facts were these: mr. no. 001's last morning would be the one of september 15, 2011. he would eek out his last crow that pinkly blue painted morn. he would grab a small beak's worth of pelletized barley. and then he would take just a short jog around the coops immediate surroundings. reaching no further than the southwest corner. that is where his body was found. time of death unclear but the humans were certain that it happened somewhere between 08h17 and 09h06 that morning. during milking. for as the milking girls were being led out, after giving their wondrous gift of milk to the Undeserving, mr. no. 001 was found. dead. headless. little rose pig standing atop with one foot upon his limp body. her mouth and surrounding whiskers bloody. his head gone. petit monsieur standing quietly nearby --with the most inconspicuous of limps. and, to only the discerning eye, a glimmer of the softest down feather stuck to the bottom his left talon. black and grey in color. bardrock markings. ...it is vital to understand the mental state of both our suspects to determine what happened to mr. no. 001.
mr. no. 001's petulant approach to his post brought shame to the House of Petit Monsieur. for a man who took such intense pride in his work. mr. no. 001 made an unwelcome mockery of the crown. sloth, cowardice, insubordination. it made petit monsieur sick to his noble gizzard to think of the meekness with which no. 001 patrolled his kingdom. he couldn't afford such poor representation of a rooster in his flock. he couldn't stand to see no. 001's girls wandering the yard with no certain direction. but could pride and honor to the Flock be motive enough for murder? could it possibly be that the rooster-man the entire barnyard envied, loved, confided in, be capable of such cold blooded violence? and on the other Side of Things...rose had been quite the hungry duckling that afternoon. the day before had...not gone well. her older brother, van gogh, was growing to hulking proportions and at a cost to rose. she had learned to grab 3 apples at a time in her mouth and run away from van gogh every time humans dropped them their feed. but the ingenious method had nearly cost her her life when she briefly chocked on the penultimate pomme that morning. she worried continuously about her next meal and how to pry it out of the strong jaws of her brother. she started to develop an angry twitch of both the head and vocal cords whenever her eyes caught a shadow moving upon her. food was her raison d'etre. and concocting innovative ways all the day long to collect this food was a tiring endeavor for such a little girl. and so one couldn't help but wonder...did mr. no. 001, overcome with ennui and insubordination go down for a mid morning nap al fresco? and did a certain ravenous rose-pig come upon the slumbering bird and mistake him for a post-breakfast snack? or was it petit monsieur that decided thursday morning would be a TCB kind-of-a-day and issue one swift cold blow to the Unsuspecting's head? and then did he call upon his ever hungry carolina colleague to destroy the remains of that grim morning? van gogh, the four goats, and the milking cows all remain unsure. there are only three barnyard beings that could tell you in lucid detail what happened that day. one of whom is dead. the other two ... the other two are a pig and a rooster. one speaks a broken franglais. the other just wants to know if you have any leads on apples and whey. in my mind little miss rose may have come to mr. mister's rescue after a fight! Hilarious AND heartbreaking. What a bizarre scene to find!